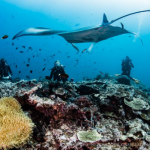 Rascal Voyages is partnering with Conservation International Indonesia (CIIndonesia) to give luxury travellers the opportunity to play a part in contributing to conservation and reducing the negative impact of tourism in some of the world’s most remote and protected waters. Having already made waves in luxury travel as the first private charter Phinisi to offer an entirely above-water accommodation experience across the Indonesian archipelago, the new ‘Exploration Series’ comes in line with Rascal’s recent announcement to unveil more Phinisi vessels across the region. With a fleet of five further boats in the making, ‘The Exploration Series’ will take guests on journeys across the Indonesian Archipelago, Southeast Asia, The Indian Ocean and beyond. some of the most luxurious on-board cruising environments. The expeditions will strengthen Rascal’s commitment to marine preservation whilst offering the charter guests true world-class service and unforgettable hospitality – from pop-up island dinners to onboard cocktail parties and unparalleled snorkelling and diving opportunities. The initiative will see Rascal go truly off-grid, giving guests the opportunity to witness unprecedented breakthroughs in the scientific understanding of marine biodiversity. The unique itineraries will visit virtually untouched areas of extreme natural beauty, often sailing where no tourist has sailed before, and creating an enlightening, educational journey for conscious travellers. involved with tagging turtles and mantas – a truly once in a lifetime experience. 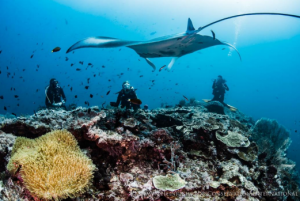 Later expeditions will be announced in due course and will include a journey to Cenderawasih Bay, the playground of one of the world’s largest animals – the Whale Shark. In a fascinating phenomenon of natural wonder, these sharks inhabit the Cenderawasih area year-round, providing divers with the potential of jawdropping encounters with the incredible creatures. During this voyage, the Conservation International Indonesia scientists will satellite tag the Whale Sharks to help build a better picture of the movements and behaviours of these gentle giants. Other trips will include surveying Walking Sharks along North Papua coast, Hammerhead Shark tagging by the CI Indonesia experts in Banda Sea and tagging of Thresher Sharks in Alor. The tags for hammerheads and thresher sharks are attached for an average of 6 months, following which time, the tags harmlessly detach. Throughout this period, the tags provide the CI Indonesia experts invaluable information on the movement patterns and behaviours of the creatures, which ultimately help the expert team further their protection of the marine habitat through informing policy and Marina Protected Areas (MPAs), while empowering local communities through knowledge and training, so they continue to act as stewards for the environment. scientists from the comfort of one of the region’s most sought-after vessels.